The Women's March is an annual worldwide protest. The first Women's March took place on January 21, 2017 the day after Donald Trump was sworn in as President of the United States. The sexism of the commander and chief helped to make the inaugural event the largest single day of protest in US history. Climate protests are at the heart of growing resistance to Trump and women are leading the charge. This makes sense given that climate change and environmental degradation disproportionately disadvantage women. The first Women's March in Washington DC drew as many as one million people and as many as five million people took part nationally in hundreds of marches. Worldwide it is conservatively estimated that more than seven million people took part in almost 700 marches in more than 80 countries on all seven continents. As explained by the Sierra Club's Wendy Becktold in a 2017 article many of the women who participated in the march see environmental justice as one of the key issues. This is a view shared by the Sierra Club, 350.org, and the National Resource Defense Council. Other environmental organizations that participated include Climate Parents, Women’s Earth and Climate Action Network, the Women's Environment & Development Organization, and the People’s Climate Movement. Since 2017 people have come together in January to participate in Women's Marches all around the world. They advocate for legislation and policies that support women's rights as a human right. The environment is another issue that is important to protesters alongside immigration reform, healthcare reform, reproductive rights, LGBTQIA rights, disabled rights, racial equality, freedom of religion, workers' rights and tolerance. Environmental justice is the focus of one of ten committees established by the Women’s March Network. At the inaugural women's march in 2017 organizers said: "We believe that every person and every community in our nation has the right to clean water, clean air, and access to and enjoyment of public lands. We believe that our environment and our climate must be protected and that our land and natural resources cannot be exploited for corporate gain or greed—especially at the risk of public safety and health." Senator Bernie Sanders, who attended the 2017 March in Montpelier, Vermont, said Trump should listen to the protesters: "Listen to the needs of women. Listen to the needs of the immigrant community. Listen to the needs of workers. Listen to what's going on with regards to climate change ... Modify your positions. Let's work together to try to save this planet and protect the middle class." The NRDC's Sasha Forbes says that women are at the forefront of environmental justice. "Women across the globe have been leading environmental work for generations and will continue to lead," Sasha said in 2018. "We have been conditioned from birth to fight, because we are stewards of our homes, communities, and neighborhoods and because of the interaction we have with nature and the earth." The environment is also an issue at the 2019 Women's March. Organizations like Pete Seeger's Clearwater participated in the DC Women's March. The Hudson River sloop Clearwater is a floating environmental classroom and its education programs reach 15,000 children and adults each year. 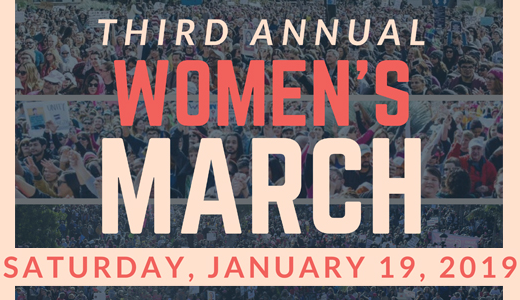 Clearwater chose to ally with the Washington, D.C. [event] organized by Women’s March, Inc. "because it gives us the opportunity to participate in the formation and advocacy of national legislation in support of environmental justice," the organization announced in a statement on its website. "Based on ongoing discussions with Women’s March, Inc., we expect this agenda to directly support current Clearwater environmental advocacy." Although claims of isolated anti-semitism have received considerable scrutiny, Clearwater is among a number of organizations that support the Women's March while disavowing prejudice of all kinds. As reported by the New York Times women around the world are challenging the rise of the far right in 2019. They are also calling for an end to inequality, the gender pay gap and violence against women. Marchers in London spoke out against Brexit and called for equality and justice, but it was also a rebuke of President Trump. The marches in Germany, Italy and Spain included protests against the rise of populism and far-right fascism. Trump has been the focus of these protests both at home and abroad, however, the women's movement is much bigger than the failed US president. Marches also took place on Sunday in cities such as Sydney, Australia, Taipei, Buenos Aires. Other similar marches are scheduled to take place later in the year.